When a festival that isn’t based around country music opens its gates for the genre then they have my attention. A genre so often misunderstood in this country, BST Hyde Park is one of two mixed genre festivals that I go to annually based on their inclusion of country music artists. Last year saw an impressive line up for country and americana artists such as The Wandering Hearts, Ward Thomas, Juanita Stein, Jade Bird, Catherine McGrath and more and this year, it is even better. BST runs over the course of two weekends and the event organisers invited country/americana and blues acts for not just one day but four. Artists over the four days included the return of The Wandering Hearts, Ward Thomas, Catherine McGrath and more and brought on artists such as Ryan Kinder, Lukas Nelson & Promise of the Real, The Shires, Sarah Darling, Robert Vincent, Seasick Steve, CC Smugglers, Kelly McGrath, Eric Paslay, The Americans, Ferris & Sylvester, The Adelaides, Megan McKenna and more. The Wandering Hearts returned this year to The Barclaycard Stage after wowing audiences last year supporting Tom Petty and The Heartbreakers. With a busy summer festival schedule, this fantastic americana/country vocal group are a “must see” act at any event. The groups flawless harmonies always captivate their audience especially with tracks such as Burning Bridges. The Wandering Hearts sensational live performance always shines and they were where they belonged on the main stage. Songs such as Devil and Wish I Could took the BST audience by storm and their on stage banter is always fun. This group are the real deal and if you haven’t already got their album Wild Silence, then grab it now. The Great Oak Stage is quite impressive visually with two oak tree replicas at each side of the stage. My only complaint would be it does cause a bit of viewing restriction but I didn’t hear many complaints about it. There were mixed opinions on the separation of ticket holders with the main stage access being broken into Gold Circle, Premium Viewing and General. These separations didn’t apply for the other stages though and it was pretty easy to get a great spot at both Barclaycard and Summer stage which held a high calibre of artists alone. The viewing platform for accessible needs had a fantastic viewpoint with a lot of ease and space. I hope to touch more on this in a further review during Paul Simon’s day. What I did notice was there were many spaces available, more than I expected and staff were at the ready to bring you refreshments upon ordering. The overall line up was unforgettable and absolutely spot on! BST know how to mix it up but in a way that each artist will appeal to the headliners audience. Steve Winwood treated his audience with a wide range of his legendary back catalogue and the crowd went wild for Higher Love, myself included. Winwood and his bands instrumental jamming segments were phenomenal and were the perfect setting for a festival environment. Things got heated up during Santana as many of the events fans were there for them. Carlos Santana, still in his prime gave an unforgettable performance alongside his highly talented band who sent the crowd crazy with hits such as Maria Maria and Smooth. The vocalists really got the crowd going and had them all jumping up and down and chanting and with a crowd that large, it made for incredible viewing. The music of Santana is something else live and really fun. Fan or not, you would have been hard pressed to find someone not enjoying the atmospheric vibe that their music set off which again, in a festival environment was perfection. One audience member even said that it was the best set he had ever seen from Santana. Eric Clapton of course did not disappoint his audience and one thing that I keep hearing is just how much everyone loved the acoustic segment where he performed songs such as Tears in Heaven and Layla. With so many hits under his belt, Clapton catered for all his fans and his unbeatable guitar skills played a huge part of why his set was just so dang good. 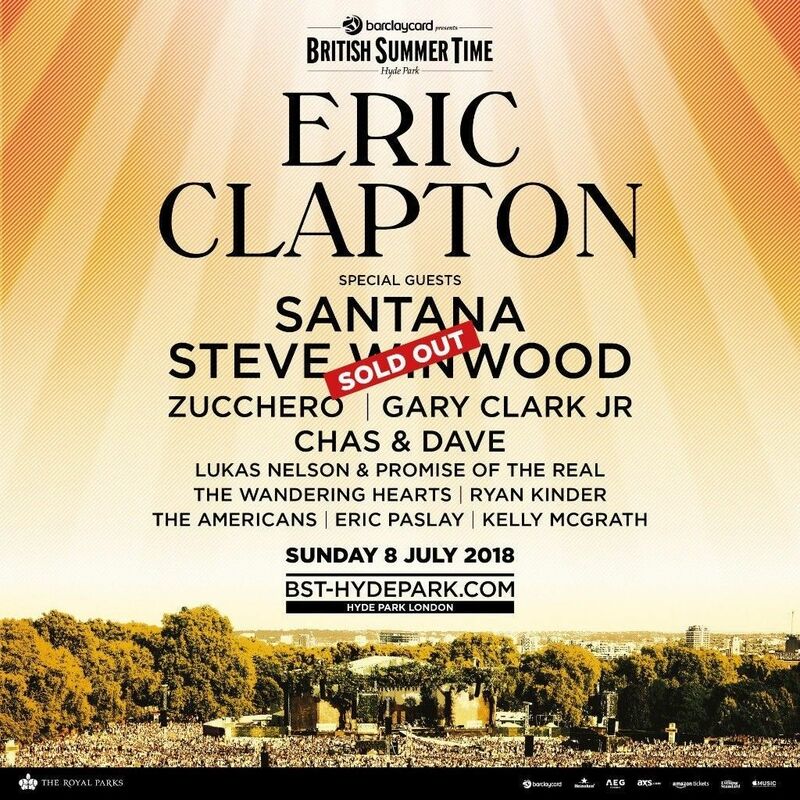 Known for bringing on fellow festival billed artists on stage with him, Clapton brought on Santana which was a guitar jam match made in heaven. We were expecting the appearance of Steve Winwood but hey ho, it’s not as if that made the set less spectacular. Despite being such a hot day, there was an infectious atmosphere floating around the park with music fans of all ages. The layout was easy to follow with the Summer Stage being right next to the gate 10 entrance so Festival goers can catch live shows right away. Various bars and food outlets were scattered across the park for all food and dietary needs. The merchandise tables were always incredibly busy, forming queues that seemed to be never ending but with the wide choice of merchandise available, it was hardly surprising. With an event of this size, one thing I found very helpful were the pathways surrounding the Great Oak Stage that were left unblocked. Despite the occasional human traffic Jam, the paths were not meant for people to stand and watch music but simply for access and everyone appeared to stick to this rule which made for a quick run back and forth to not just various stages but for food, drink and toilets too. BST has truly become the go to event of the year for many and I for one sincerely hope they continue to showcase country and americana music amongst their unbelievable headline acts. Country music in the UK will continue to be on the rise if festivals follow in the footsteps of BST.